These have stood up the outdoors pretty well - and have definitely had some muddy keys inserted occasionally! I give them a quick blast of SuperLube occasionally to keep them sweet, but so far I've not had any issues. Something like an Abus 83wp will see you right. Went to a lecture recently and somebody with padlock knowledge showed how easy it is to open a padlock with two small " shimmies ". He could also open most hotel room safes easily. Spent nearly an hour fiddling with one of the Withyhill locks recently as it had not been opened four 5 months. The Fairy Cave Quarry locks hang inside the gates with a small hole for access. They are a pest to open. Ultimately very little is break open free now that there are battery angle grinders. In most cases locks are only nominal. ABUS motorcycle locks have an excellent reputation. Expensive, but you get what you pay for. Thanks for all the suggestions so far. I think the important function of this lock is to work for a long time of being wet and muddy, rather than being exceptionally strong and/or vandal proof. Most modern locks come with complex keys which to me seem totally not ideal for this application. A lock which uses a simple and robust key, whilst possibly easier to pick for an expert, i would have thought is more likely to still open easily in 10 years time. The magnetic option is enticing, however i imagine the materials on the inside might not be as corrosion resistant as some of the marine options. Has anyone used one underground before? I think the bottom line is how much you want to spend. Abus are good and they do a titanium corrosion resistant locks which last ages and seem to cope with crap intrusion well,circa 30 squid in screwfix. Never had a problem with master ,although they do get corroded rather quick. Thanks Markpot. Budget is not too much of an issue, as long as it does last say 10 years. That Abus looks meaty! It's just the "Features 10-pin tumbler locking mechanism. High-precision reversible keyway with 150,000 differs. " bit that scares me off this modern style of key. 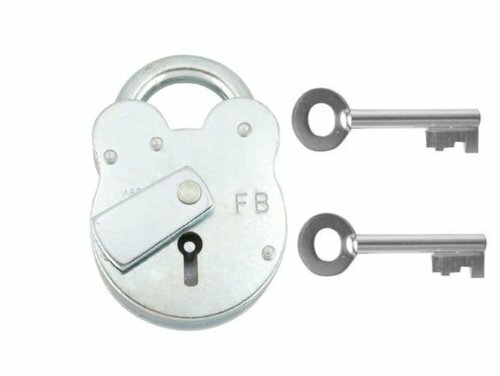 A lock which uses a simple and robust key, whilst possibly easier to pick for an expert, i would have thought is more likely to still open easily in 10 years time. 2 Likes Rob and PeteHall like this. Squire used to do an all brass version of their traditional 'Old English' padlock. It looks like they no longer do it but you might find one on e-bay. There are some on e-bay ATM but they have a steel shackle. I'm pretty certain that I've seen ones with a brass shackle in the past. The lever springs will still be steel but it would not be too difficult to pack it with silicone grease to keep the water off them. I think I know where this is for, and the one we had most success with was of the type you posted a link to rob, and the one nick mentions. No reliance on springs to pop the shackle, only the lever springs and Nick mentions. Never thought about packing it with grease, but a done with a grease gun, to force it into the nooks and crannies of the lock is a great idea. I think I know where this is for, and the one we had most success with was actually a squire one but no brass though.